"It's berry delicious." This cereal was described on the box as an "artificial strawberry flavor frosted corn cereal." 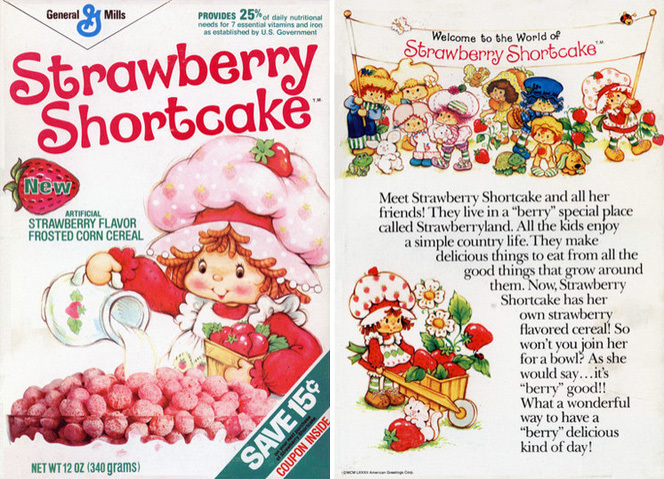 It was based on the the character Strawberry Shortcake who was originally designed in 1977 to appear on greeting cards for the American Greetings Corporation. Meet Strawberry Shortcake and all her friends! They live in a "berry" special place called Strawberryland. All the kids enjoy a simple country life. They make delicious things to eat from all the good things that grow around them. Now, Strawberry Shortcake has her own strawberry flavored cereal. So won't you join her for a bowl? As she would say... it's "berry" good! In the early 1980's, almost every girl in the world knew this little red head. 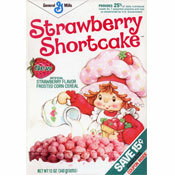 There were Strawberry Shortcake dolls, greeting cards, stickers, lunch boxes and comic books. She was featured in a number of TV specials and had her own animated series. In 2006, she starred in the movie, Strawberry Shortcake: The Sweet Dreams Movie. The little fellow to her side is her cat Custard. What do you think of Strawberry Shortcake? View all 81 comments for this cereal. This stuff looked like a standard corn puff type cereal, but the texture was soft and unlike any other cereal I've had since. The strawberry taste was strong, but not offensively so, and didn't have an obnoxiously artificial or chemical flavor at all. It says it's "frosted" but I don't remember it having a coating or being overly sweet, either. 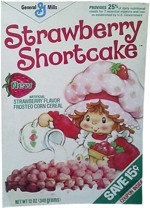 Unlike so many other cereals that get resurrected under a different name/licensed mascot, or copied by another manufacturer, I've never seen Strawberry Shortcake cereal make a reappearance of any kind. Too bad; it was a good one. Please brink it back. I've been talking about it for years! I've been craving this cereal since I was younger! BRING IT BACK! I loved this cereal when I was a kid and I'd like to see it come back again. Please and thank you. I love the commercial with Apricot and Hopsalot. Just when I can't think that little bunny can't get any cuter... Unfortunately, I never had the cereal, so I can't really give my opinion on it. But I love the commercial. Bring it back! There's no good strawberry cereals anymore. Used to be that Franken Berry was good... not anymore. I LOVE this cereal. Please bring back already! 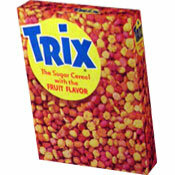 Definitely my favorite cereal from my childhood, please bring it back! This stuff tasted good at first, but it had a weird chemical aftertaste. I remember thinking it was poison when I was a kid. Strawberry Shortcake Cereal... BEST CEREAL EVER! I wish they'd bring it back and if they ever did I would hope they wouldn't alter the ingredients from the original ingredients.